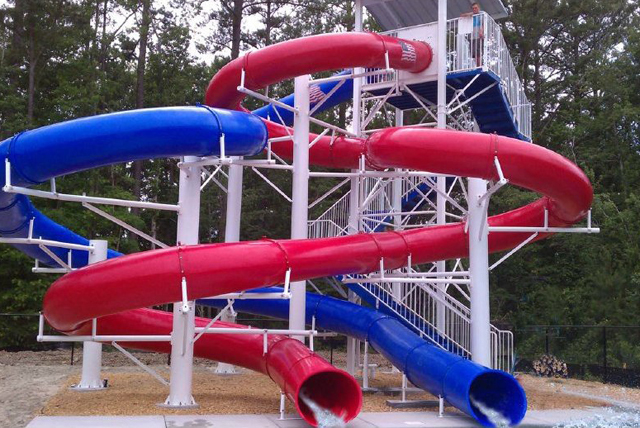 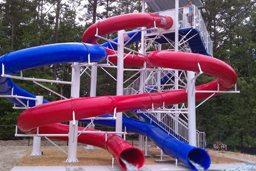 Description: Triple flume combination fiberglass & polyethylene water slide . 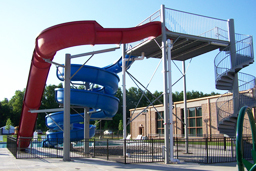 Platform Size: 12' x 16"
Space Requirements: 48’ 10” x 33’ 3” – Space requirements may vary with options chosen. 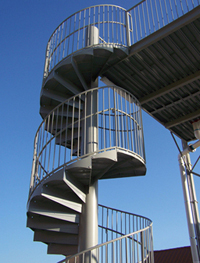 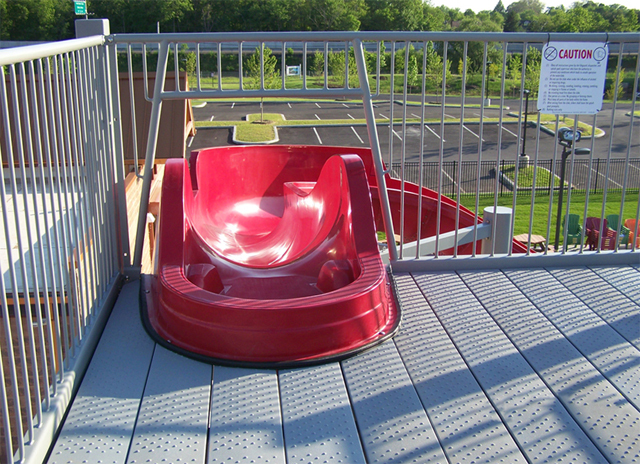 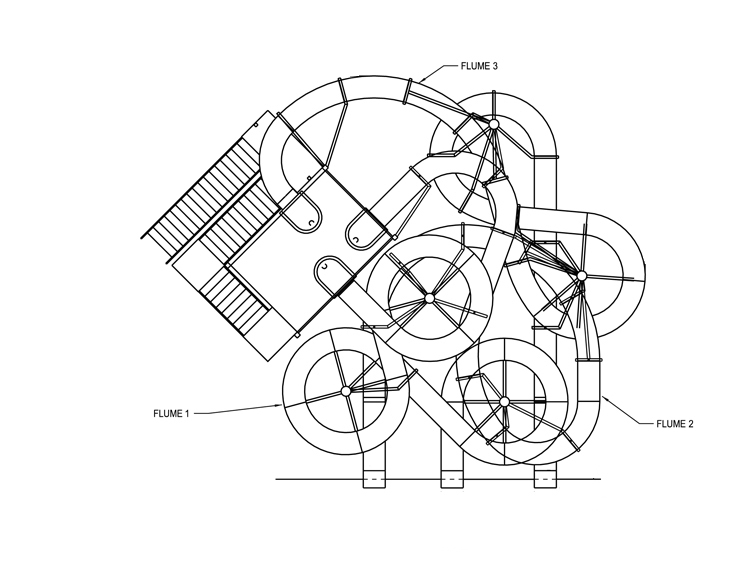 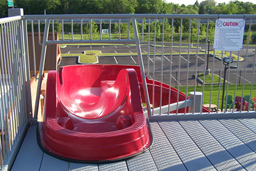 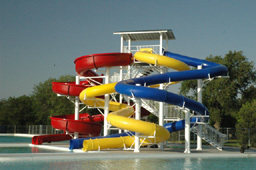 Description : Single open flume fiberglass water slide featuring (3) 270° reverse curves. 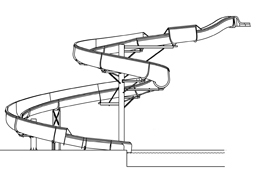 Centerline Run : 144' 8"
Entry Height : 20' 5"
Space Requirements : 44' 1" x 22' 0" – Space requirements may vary with options chosen. 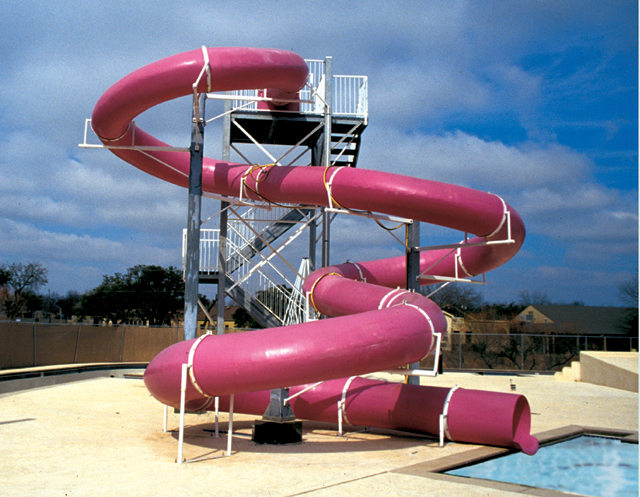 Description : Double flume 36" fiberglass water slide and 30" polyethylene I.D. 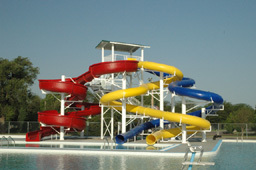 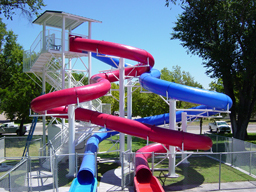 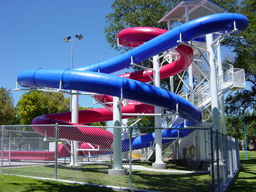 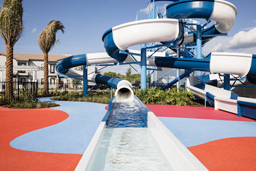 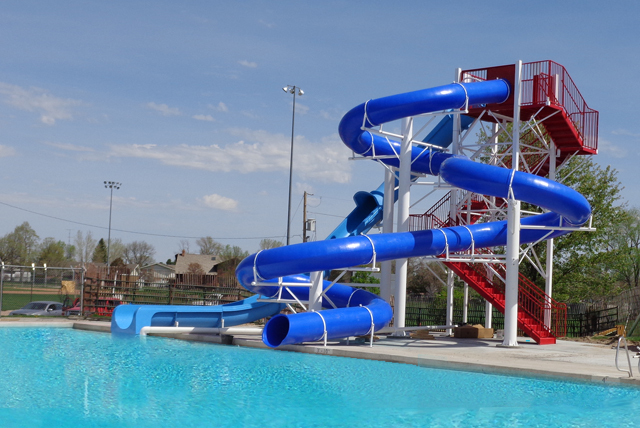 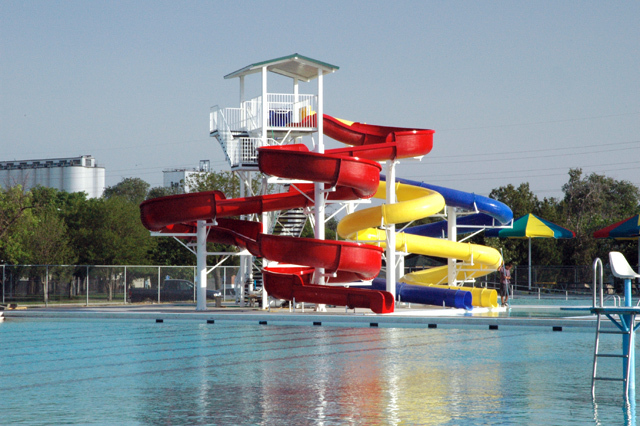 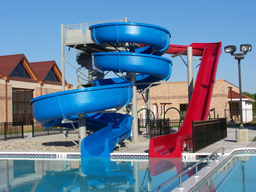 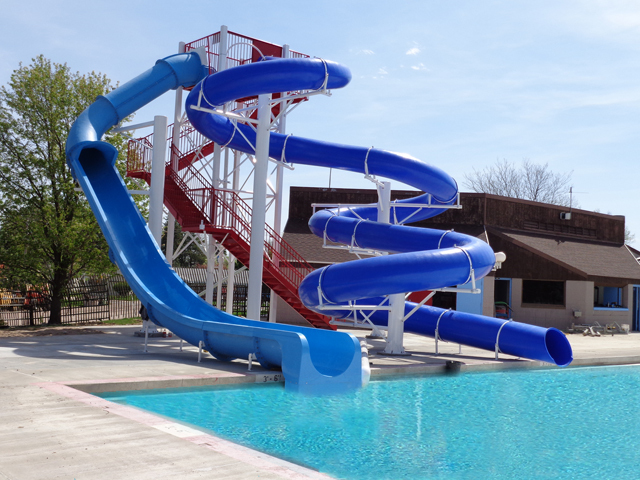 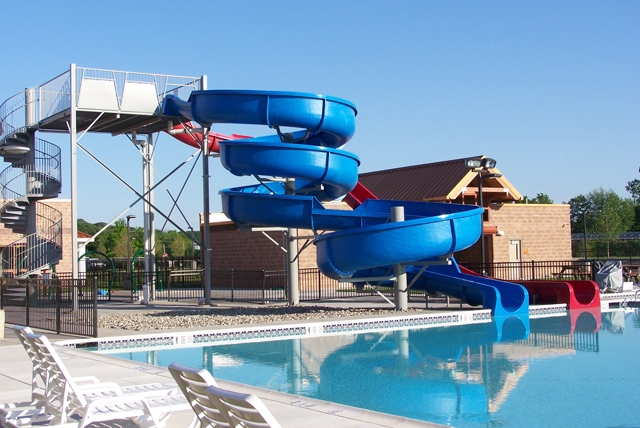 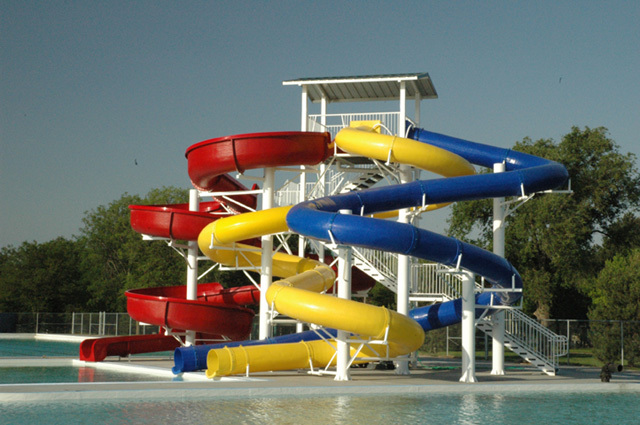 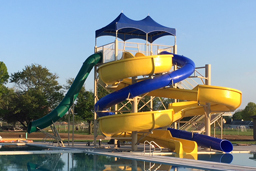 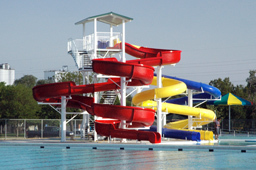 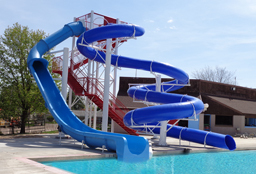 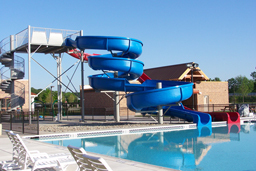 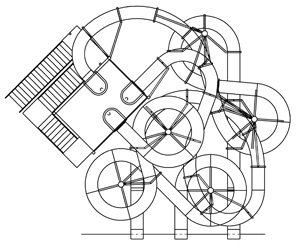 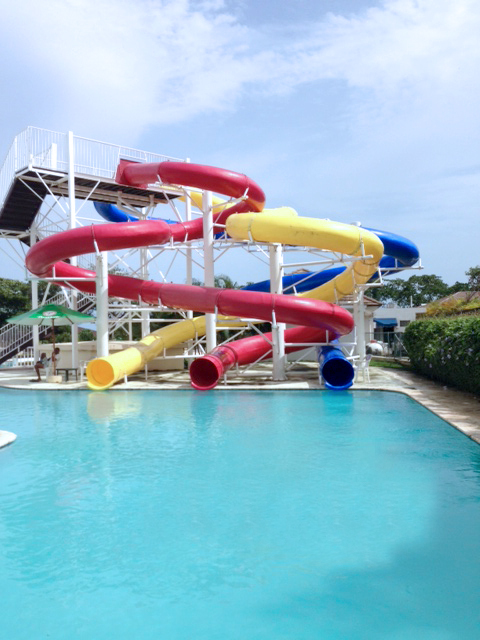 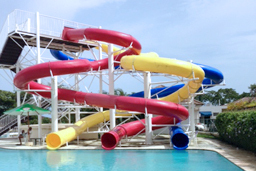 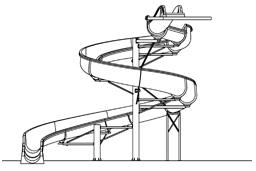 combination water slide featuring (3) 270° reverse curves (fiberglass) and (1) 270° turn (poly). 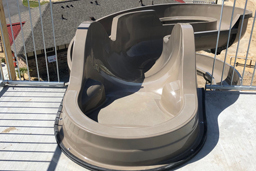 Centerline Run : Fiberglass (open) 145' 9"
Entry Height : Poly: 10' 6" Fiber: 20' 5"
Space Requirements : 21' 2 " x 53' 3" – Space requirements may vary with options chosen. 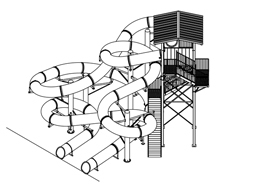 Water flow required: Open: 600-800 gpm; Closed: 20 gpm water flow recommended; 20 to 40 gpm required. 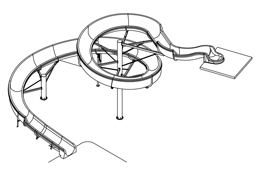 Description : Open flume body slide featuring figure 8, 360° curves and open flume 90° speed slide. 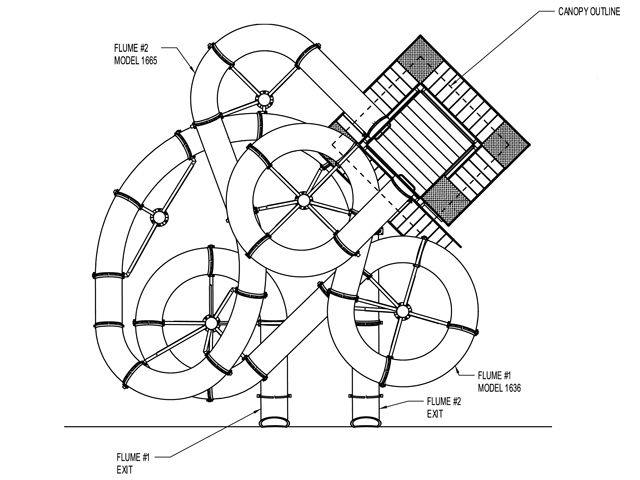 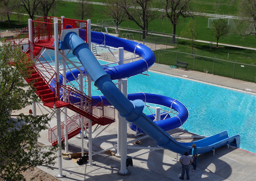 Centerline Run : Body 160' 11"; Speed 76' 5"
Entry Height : 22' 2"
Phase 2: 49' 1" x 59' 6"
Splash down dimension: Phase 1: 22' 3' x 20' 0"; Phase 2: 56' 2" x 20' 0"
CAN BE INSTALLED IN 2 PHASES ! 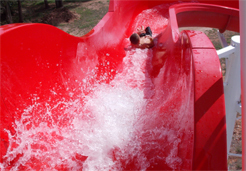 Description : Single open flume fiberglass body water slide featuring featuring (1) 180° and (2) 360° reverse curves and fiberglass speed slide water slide. 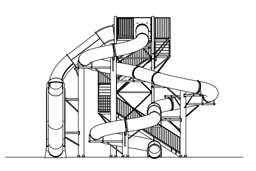 Centerline Run : Body 164' 10"; Speed 59' 0"
Entry Height : 22' 9"
Space Requirements : 36' 10" x 60' 2 " – Space requirements may vary with options chosen. Description : Double fiberglass flume water slide with fiberglass exit lanes featuring: (1) 42” I.D. 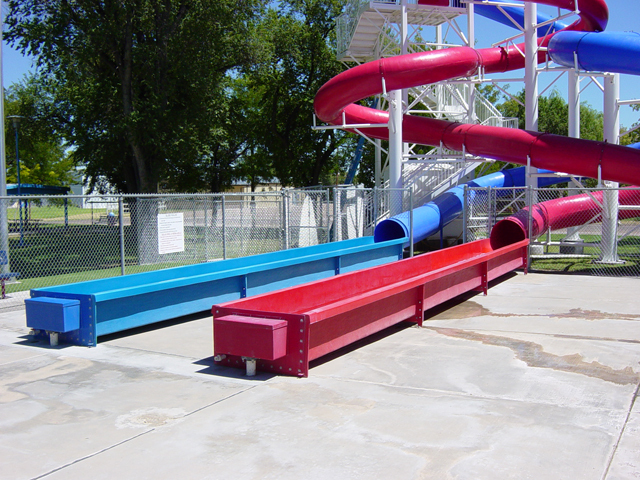 open fiberglass flume (2) 32” I.D. 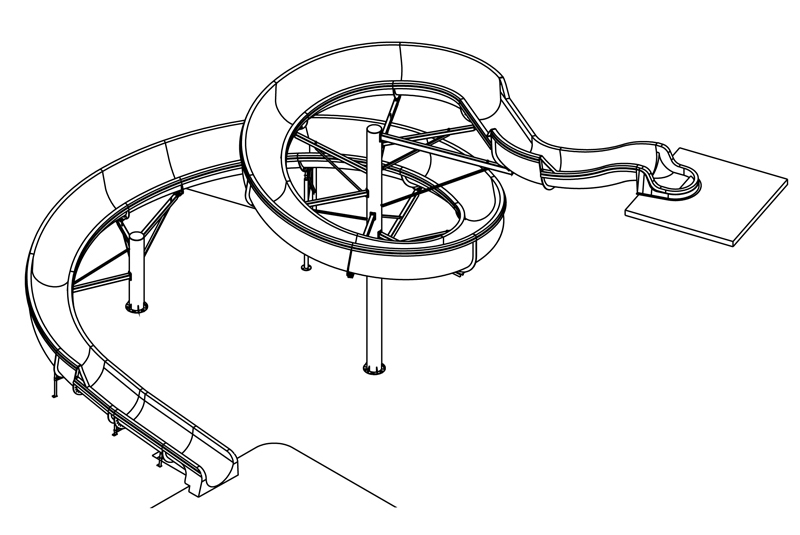 closed fiberglass flume. 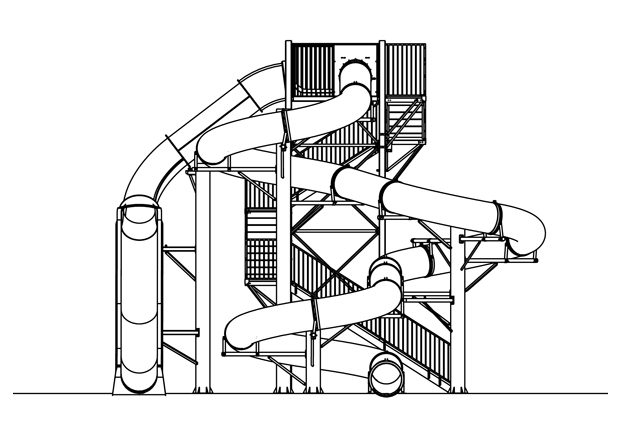 Space Requirements : 101’ 1” x 47’ 5”– Space requirements may vary with options chosen. 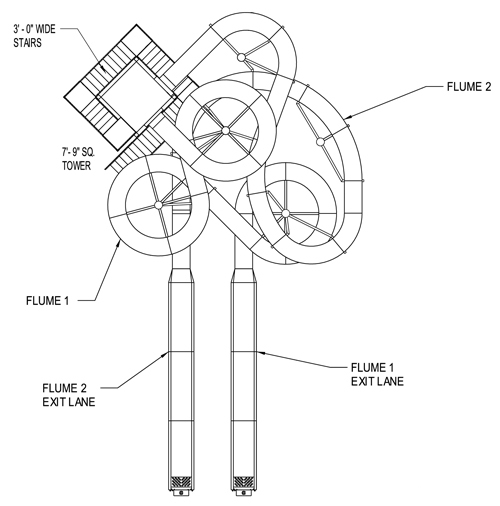 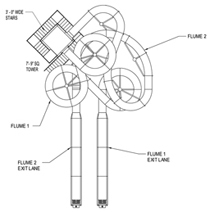 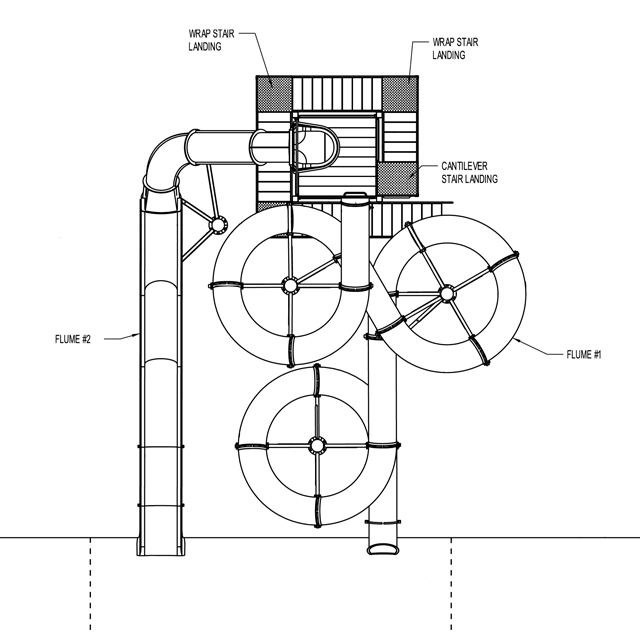 Water flow required: Flume (1): 600-800 gpm; Flume (2): 500-700 gpm. Description : Triple flume 30” I.D. 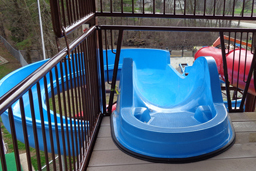 polyethylene slide featuring Cloverleaf, Switchback and Figure 8 curves. 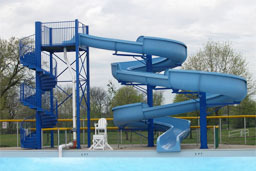 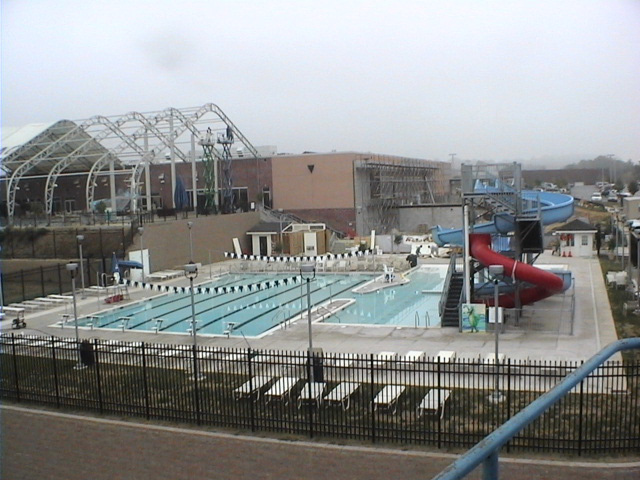 Entry Height : 23' 11"
• 1' Overhang: 58' 7" x 46’ 10"
• 3' Overhang: 58' 7" x 44’ 10"
50 gpm water flow (each flume) recommended. 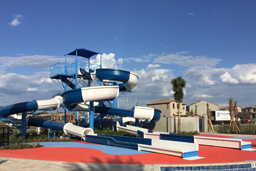 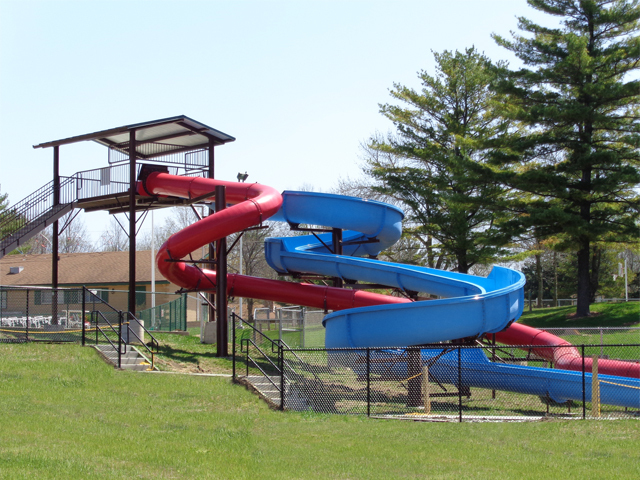 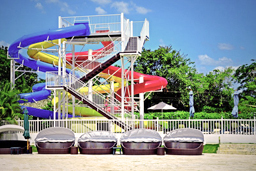 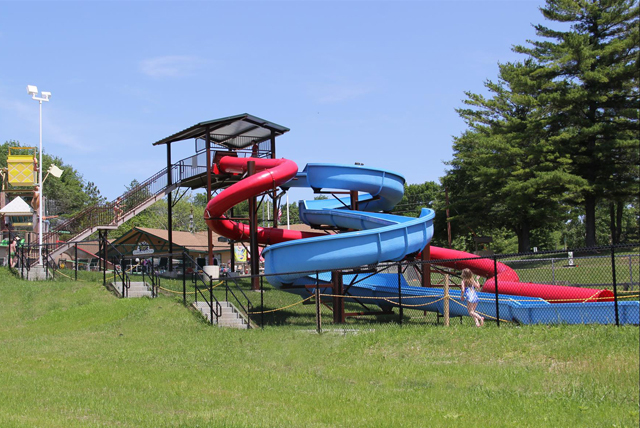 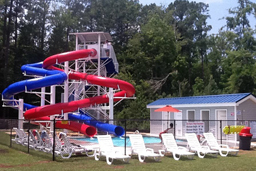 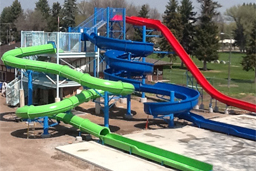 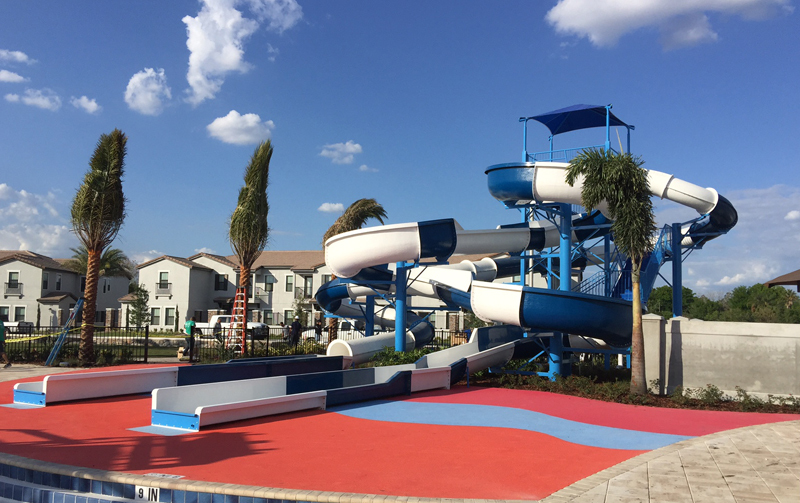 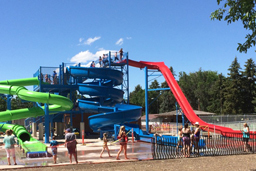 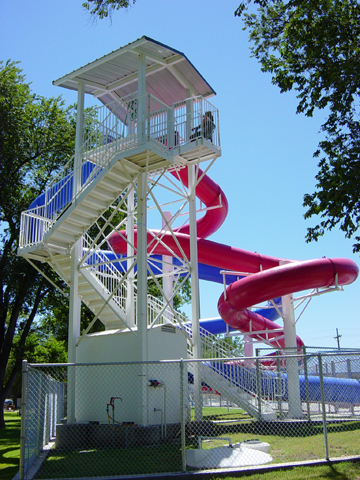 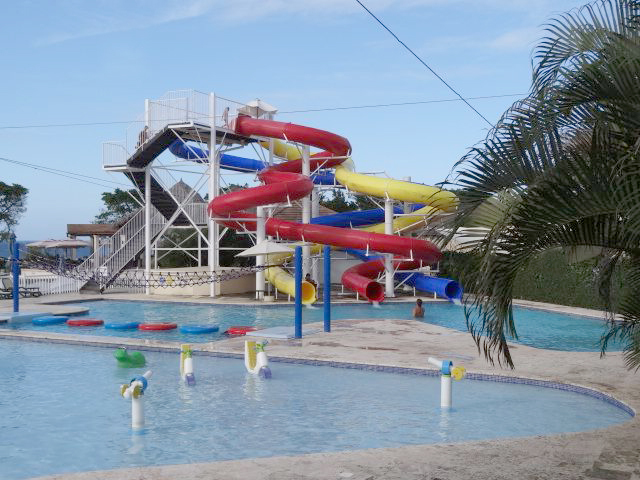 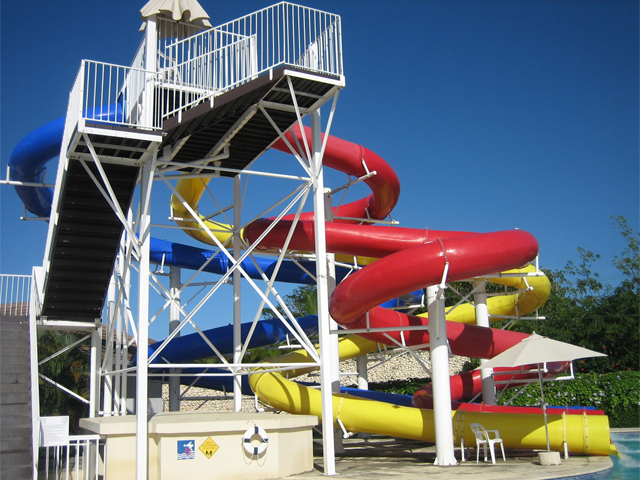 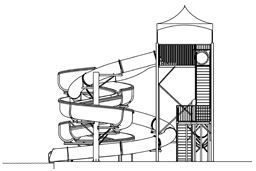 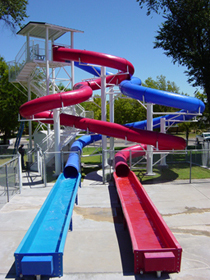 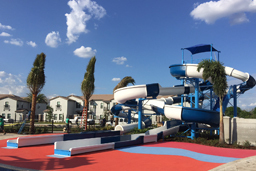 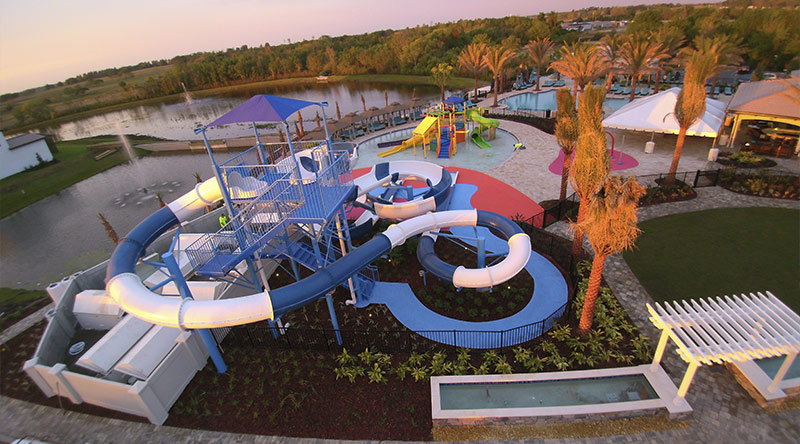 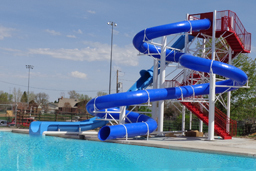 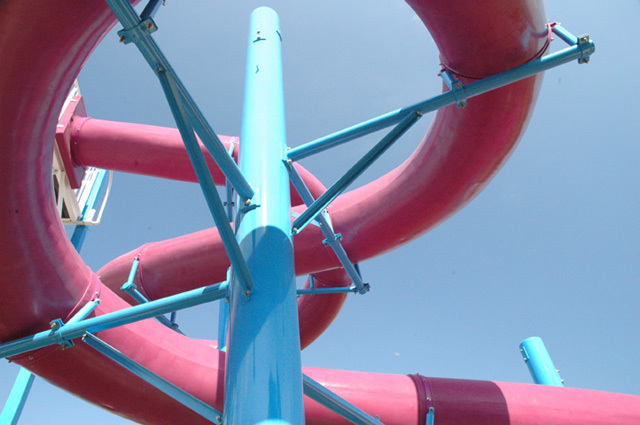 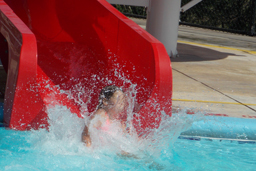 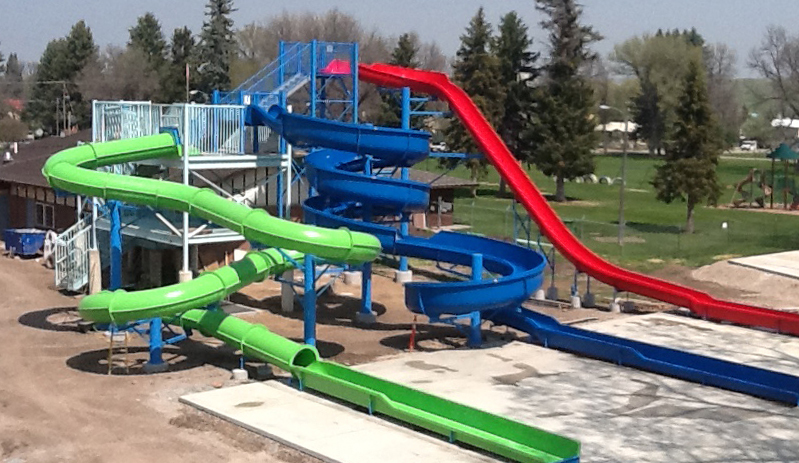 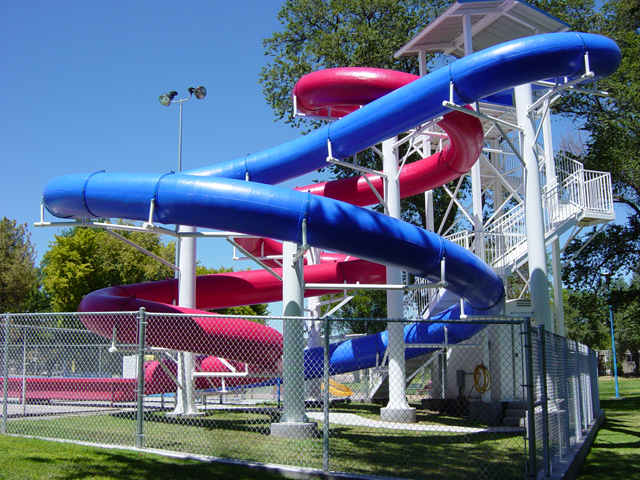 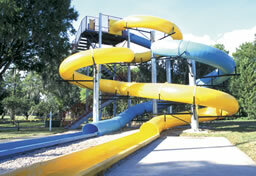 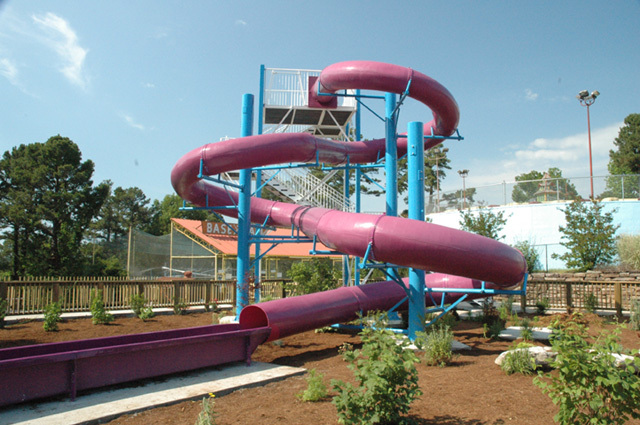 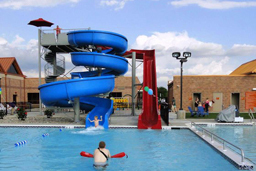 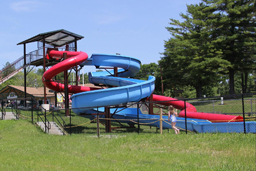 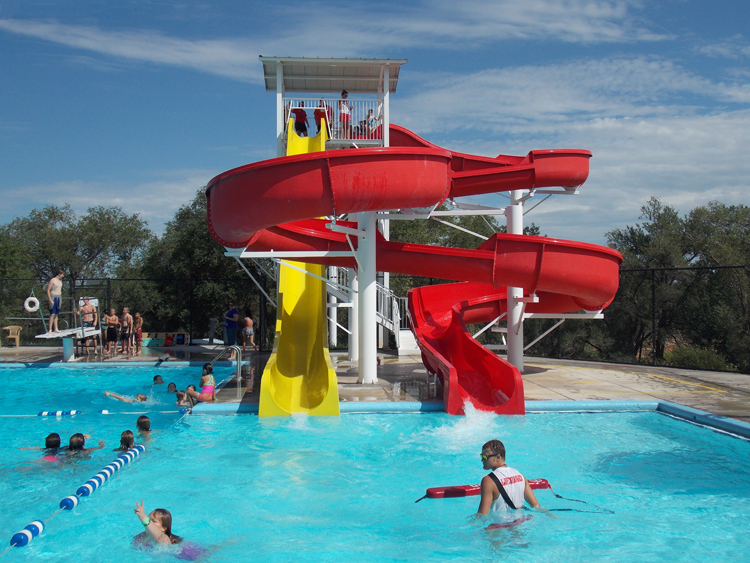 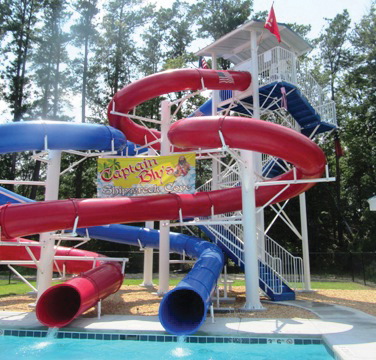 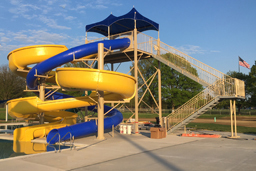 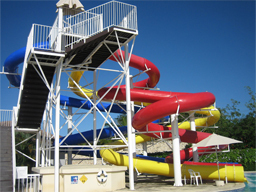 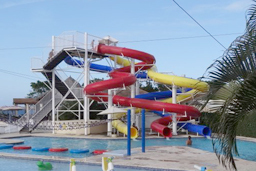 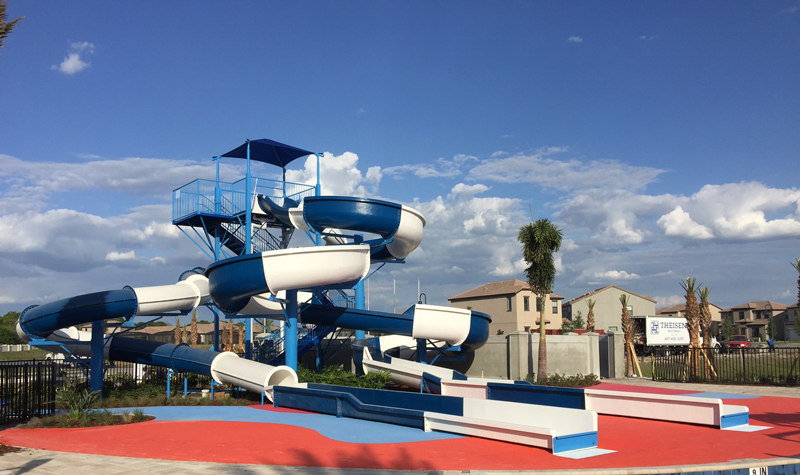 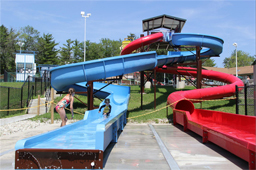 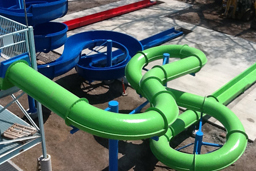 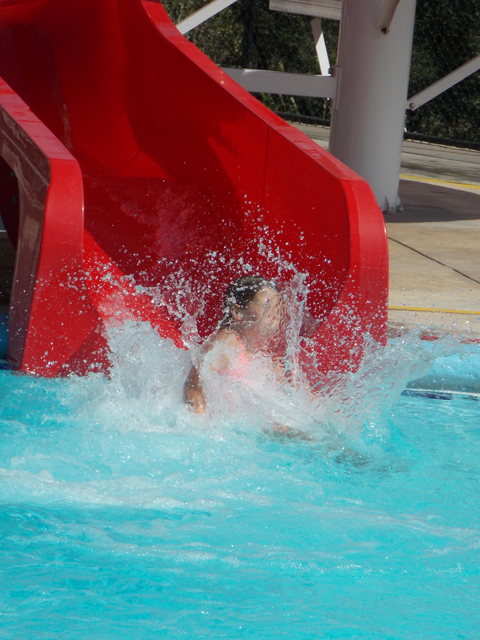 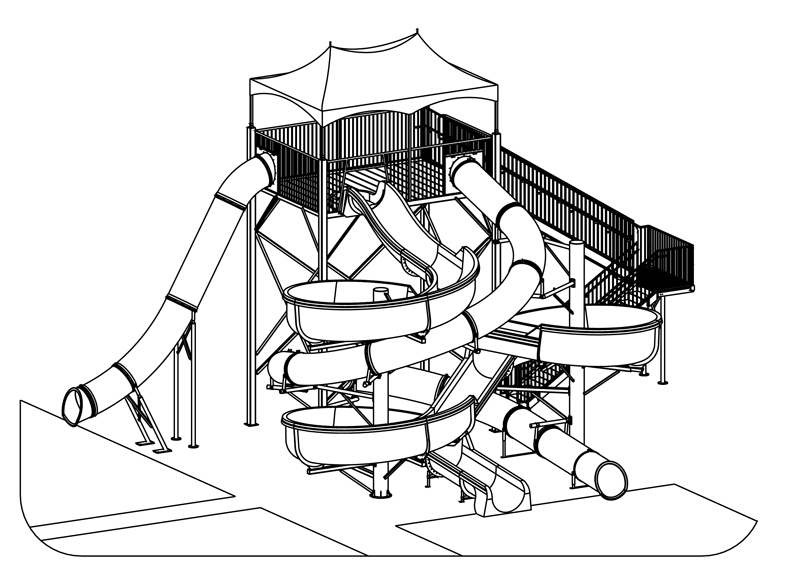 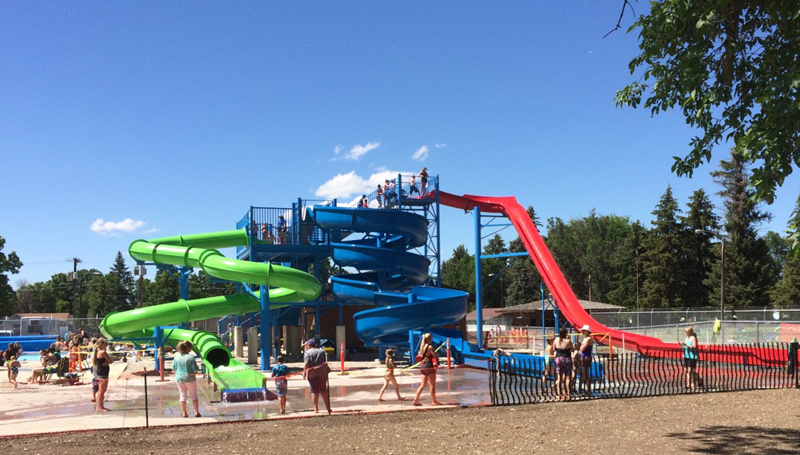 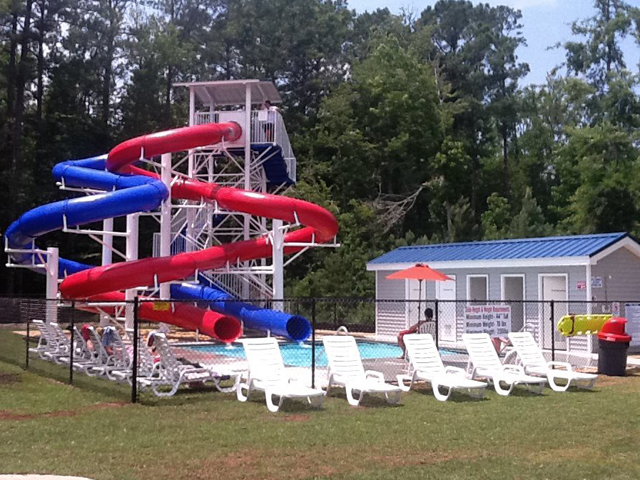 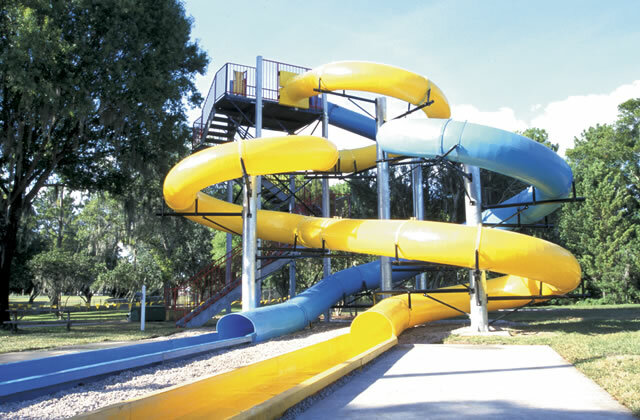 Description : Triple flume fiberglass water slide and polyethylene combination water slide. 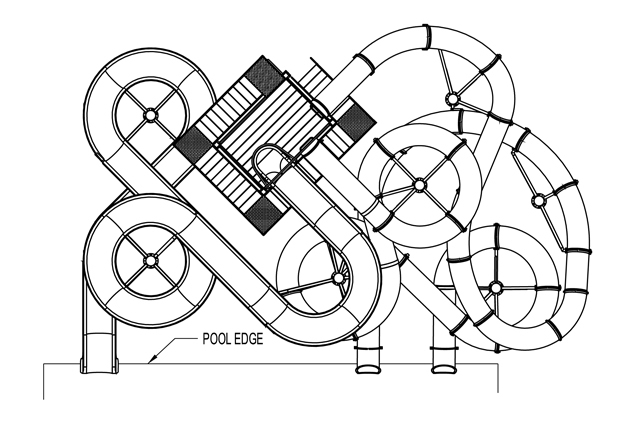 Poly (closed) (1) 145' 0"; (2) 130' 10"
Space Requirements : 57' 7" x 41' 3 "– Space requirements may vary with options chosen. 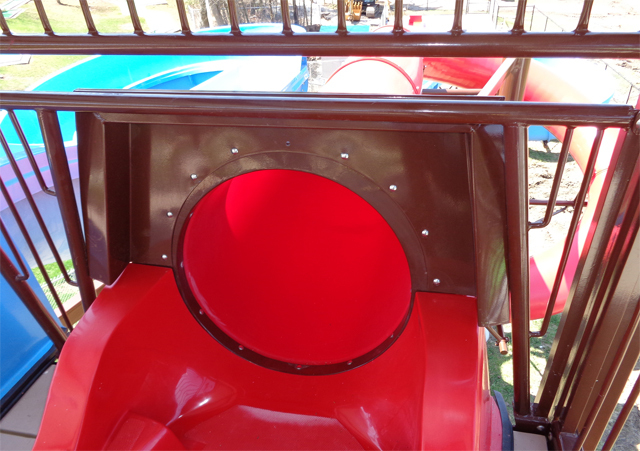 Description : Single 30" I.D. 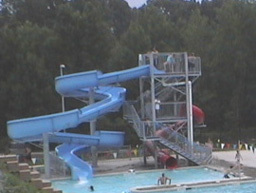 flume water slide with three turns in a cloverleaf. 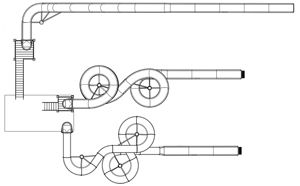 Centerline Run : 145' 0"
Entry Height : 24' 5"
Space Requirements : 38' 4" x 34' 7" – Space requirements may vary with options chosen. 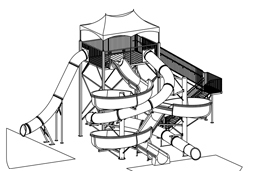 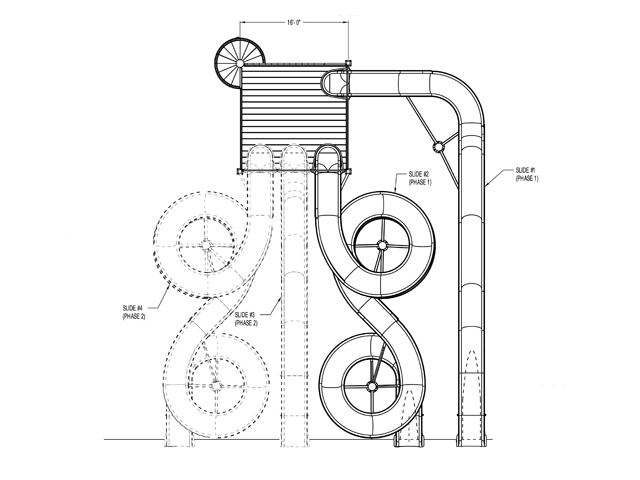 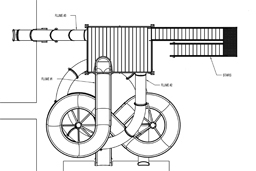 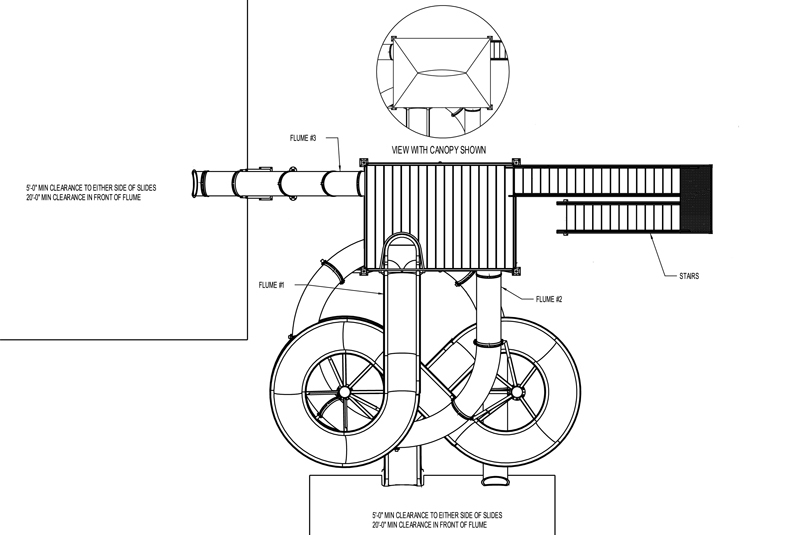 Can be ordered as phase 1 of Water Slide Model 1641 or Water Slide Model 1884. 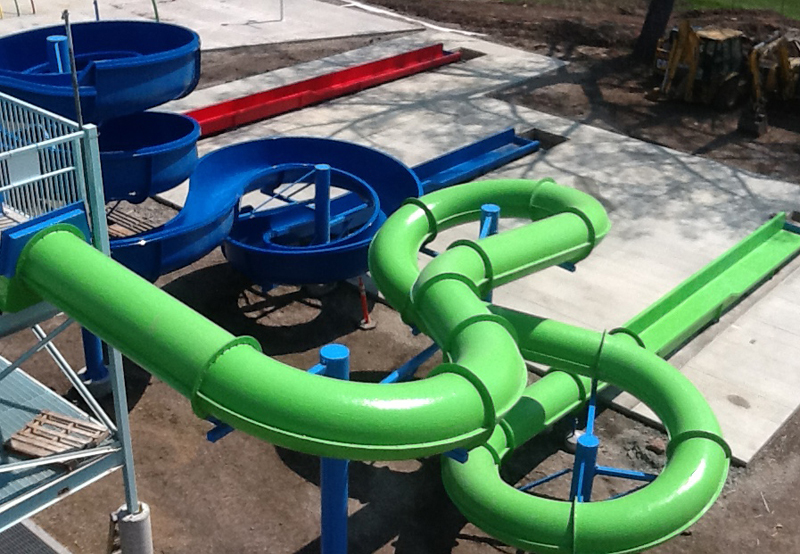 Recirculating System - NO POOL REQUIRED! 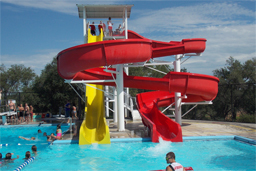 Description : Double 30" I.D. 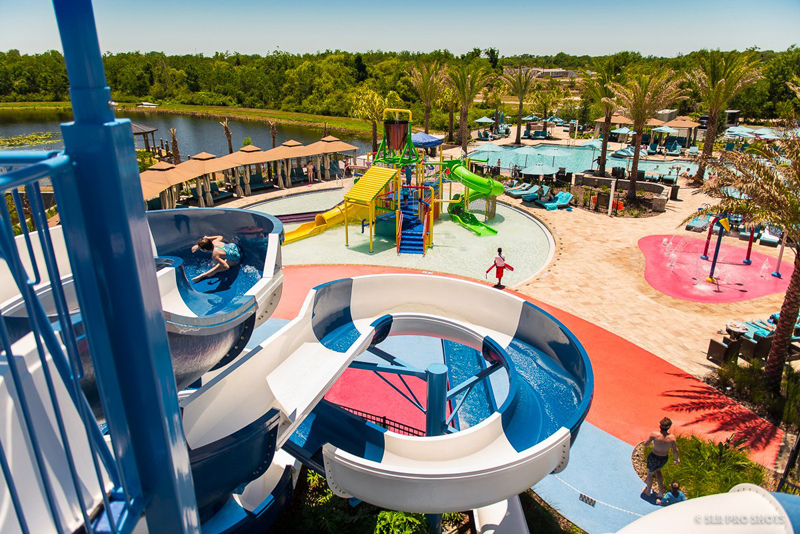 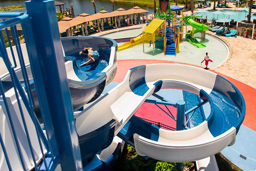 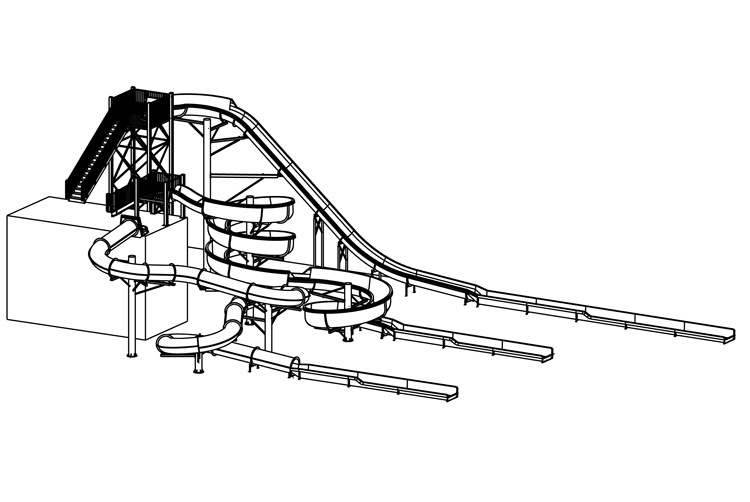 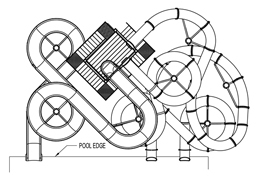 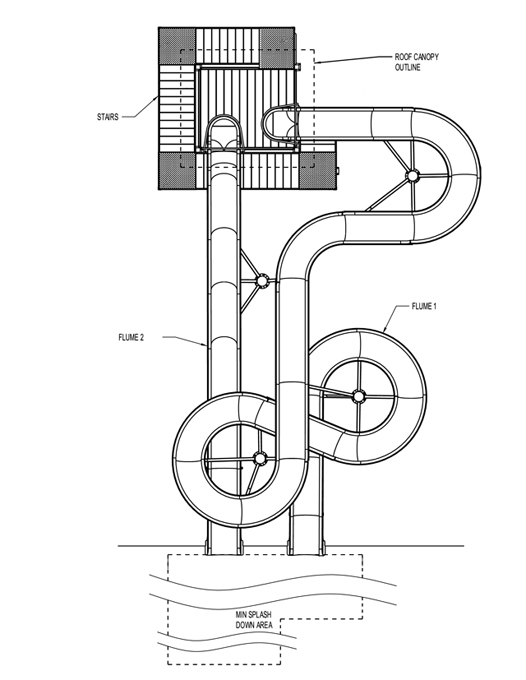 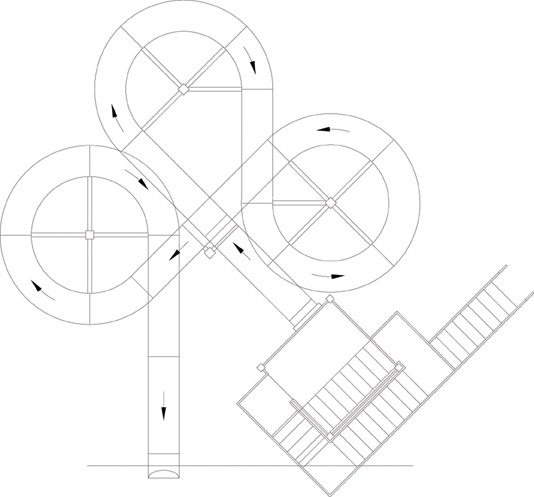 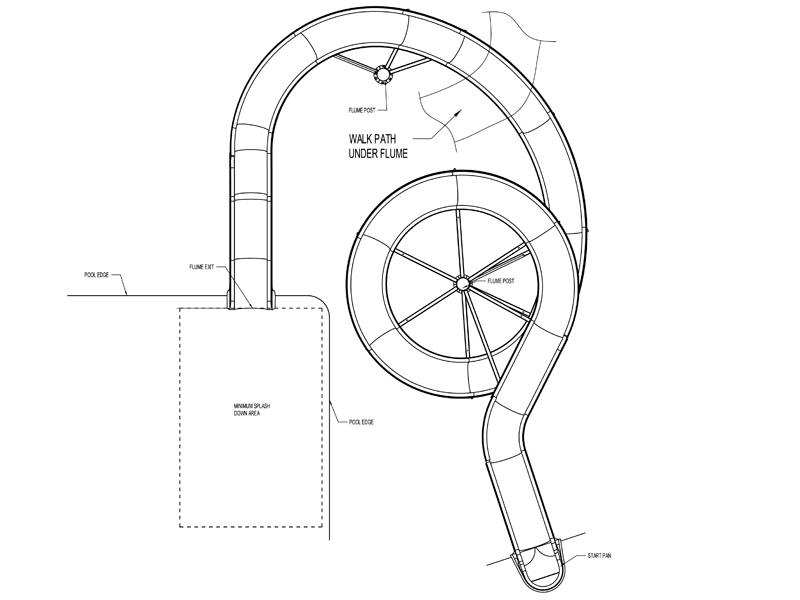 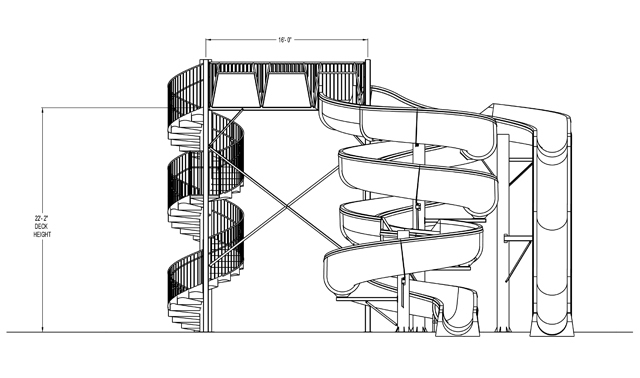 flume waterslides combining “S" curves and 360 ° turns, with fiberglass exit lanes. 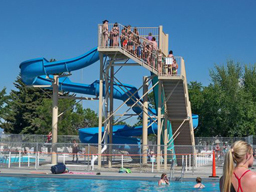 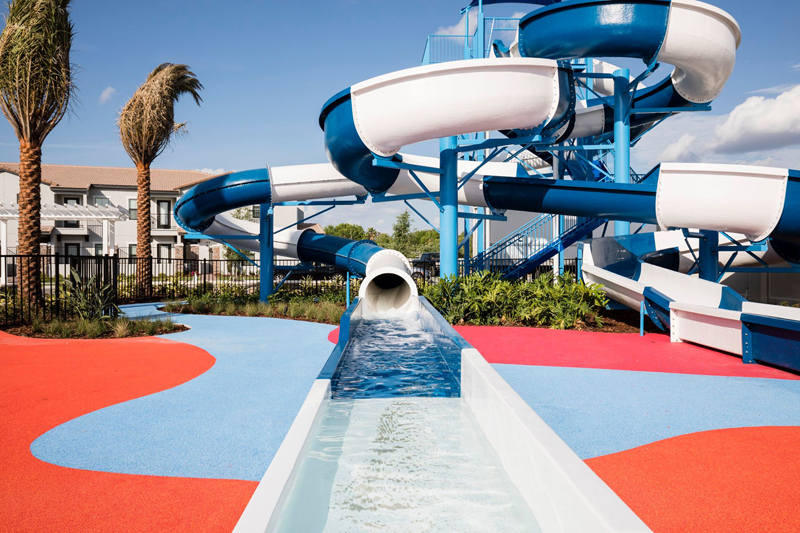 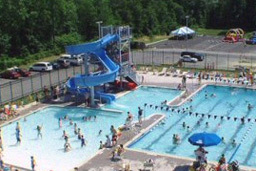 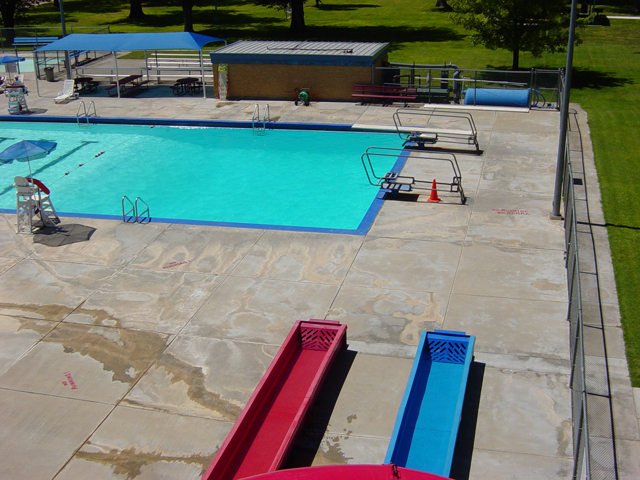 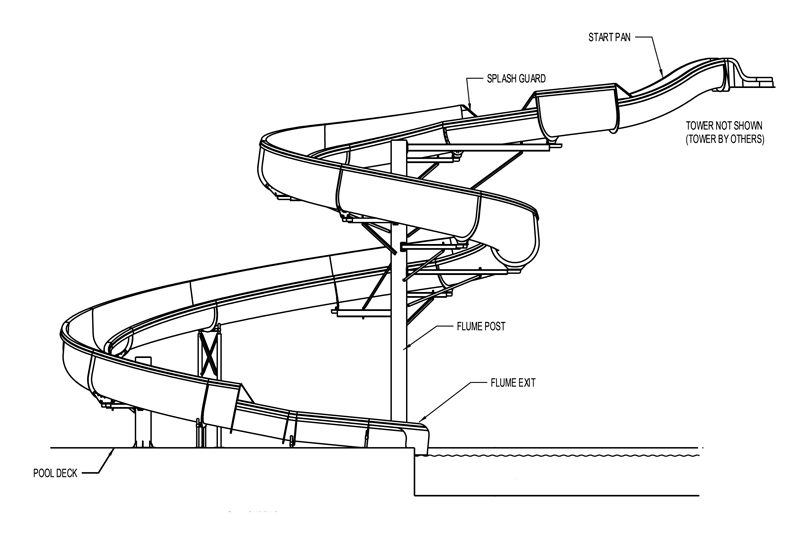 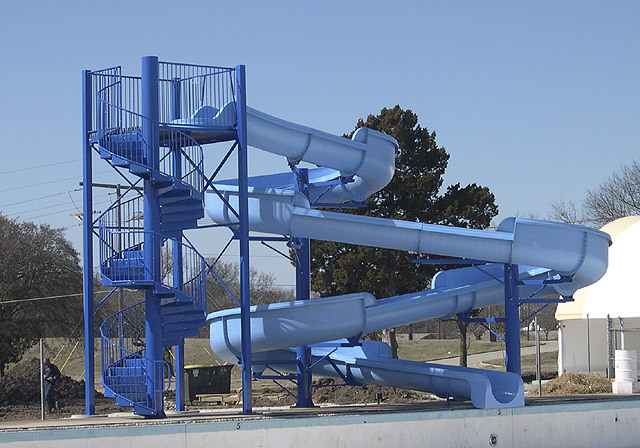 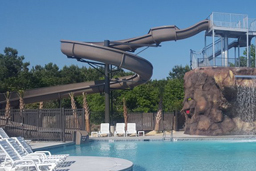 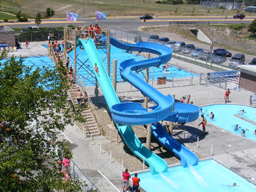 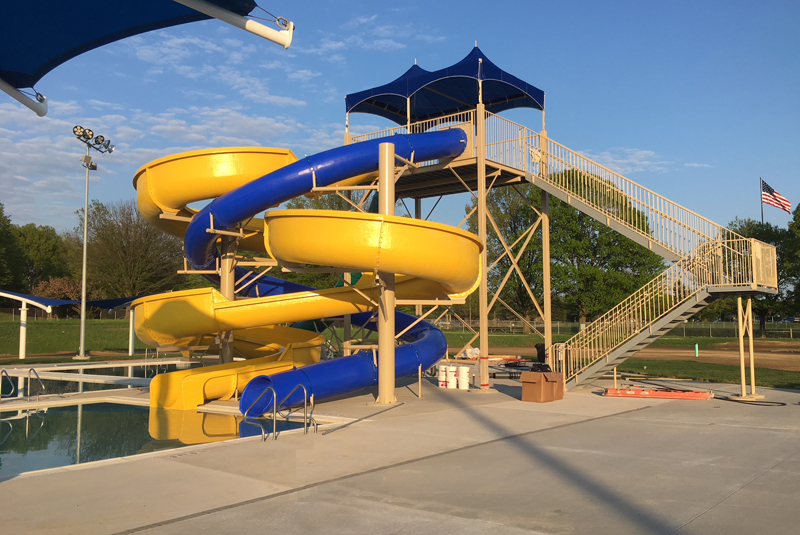 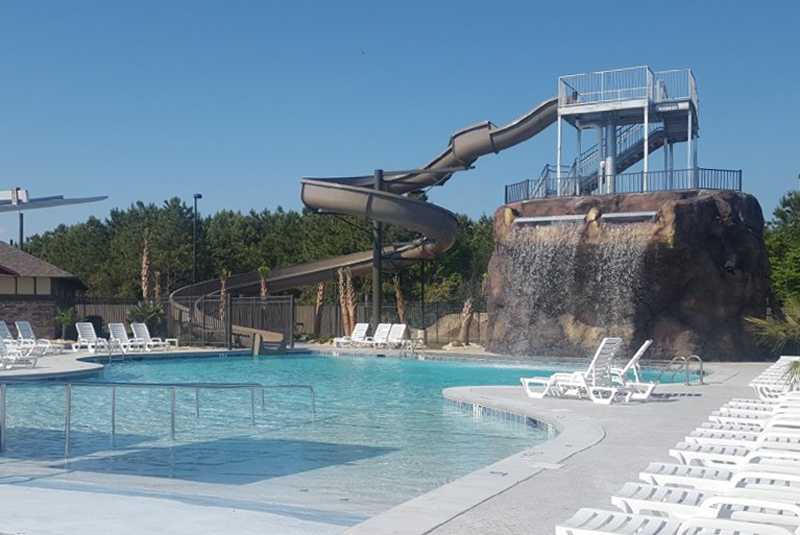 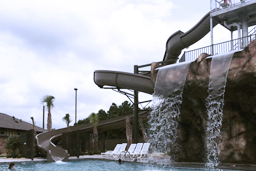 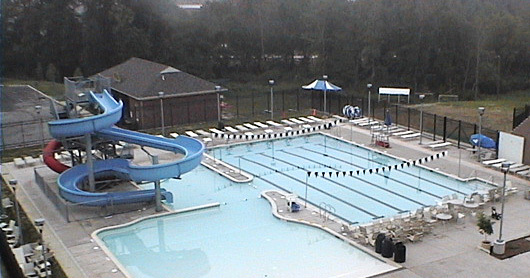 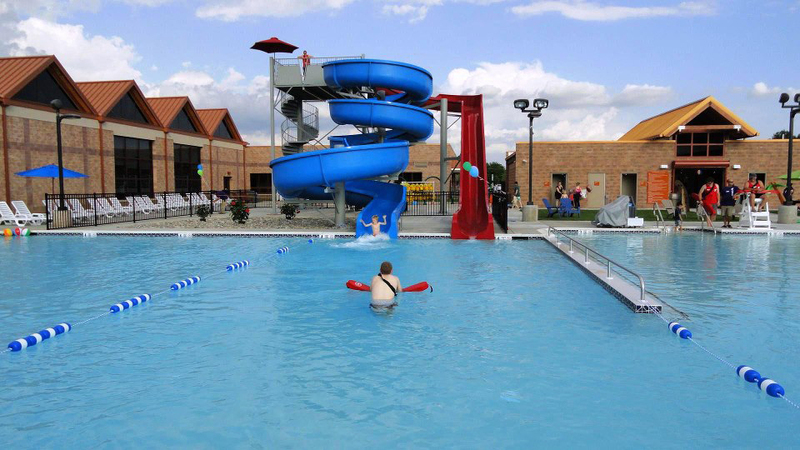 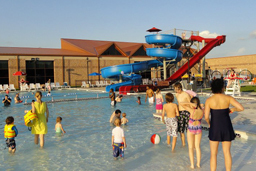 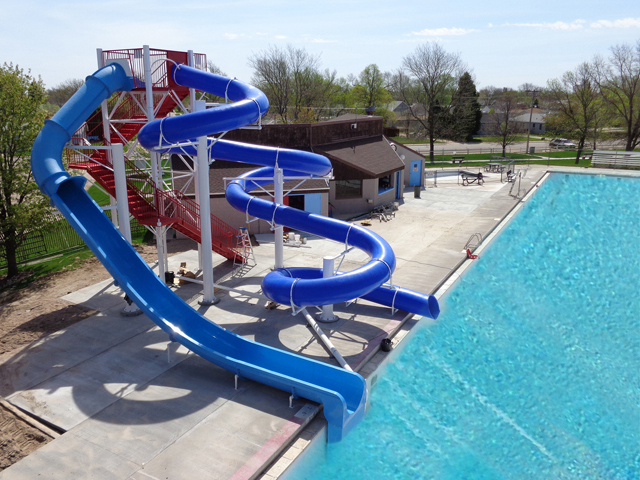 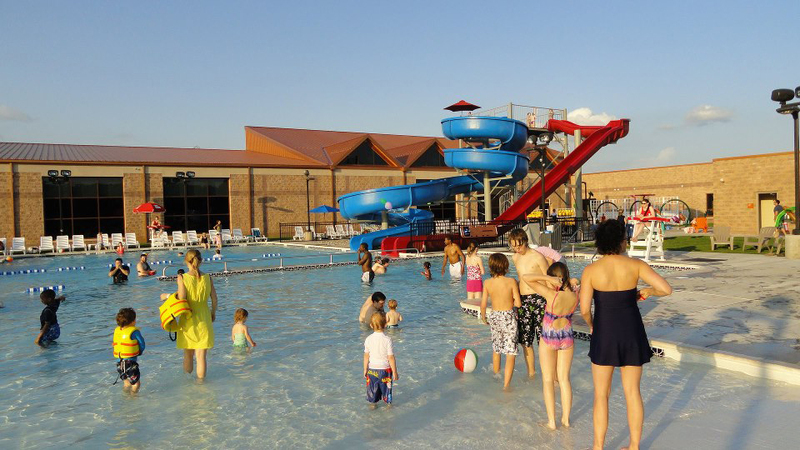 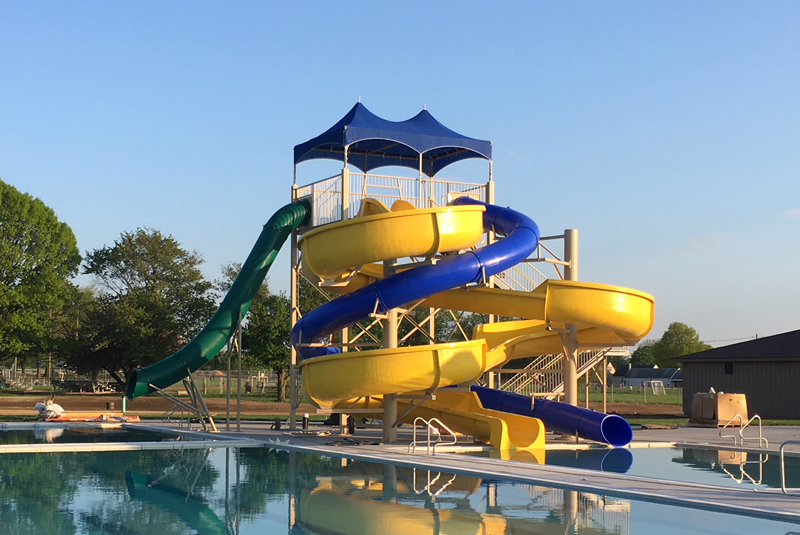 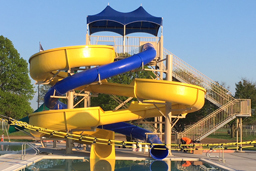 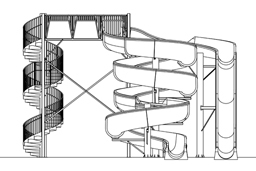 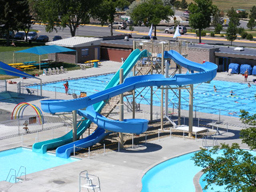 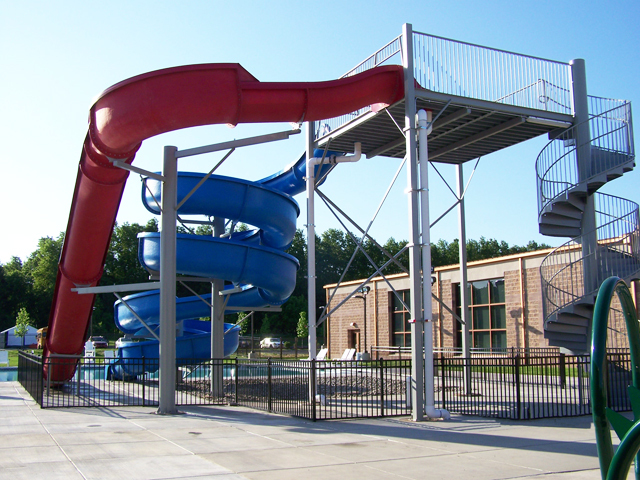 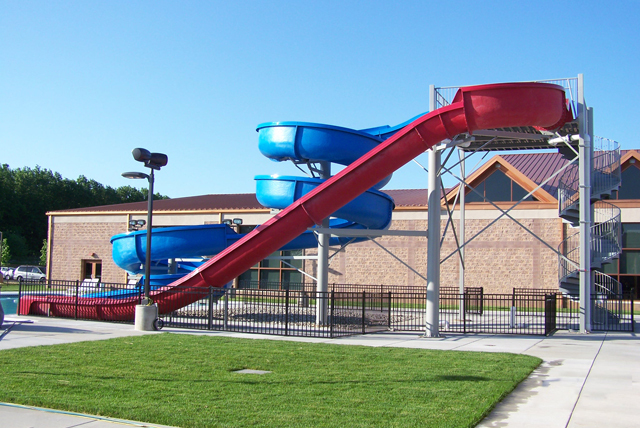 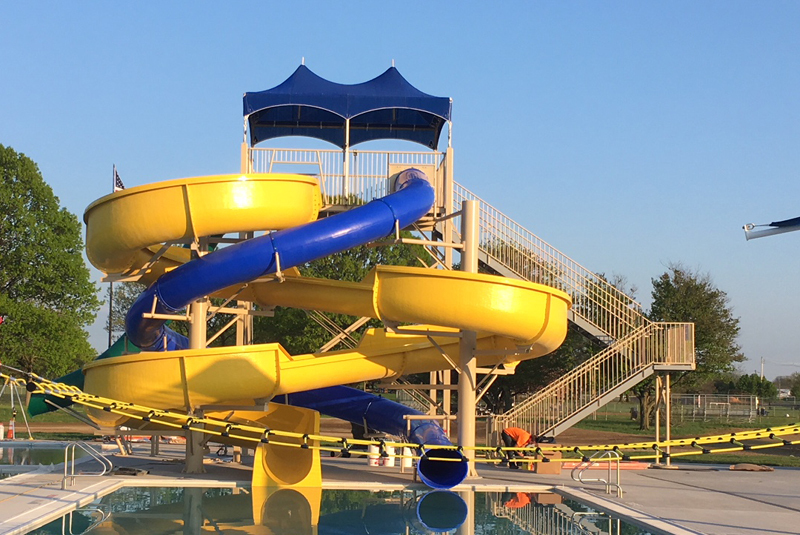 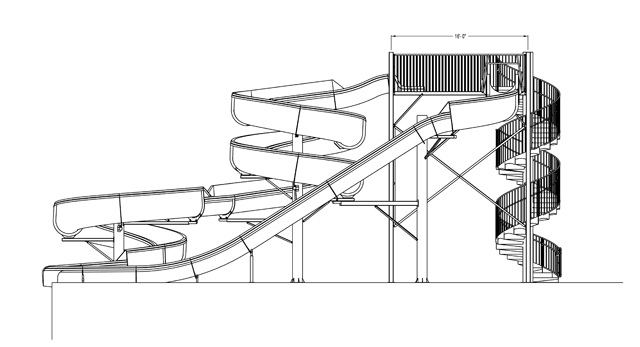 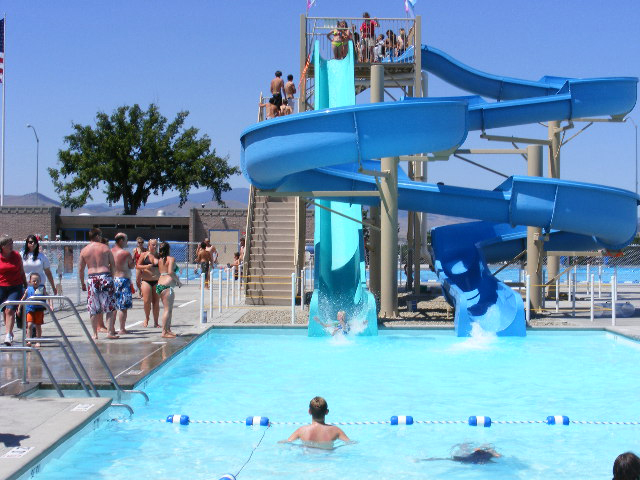 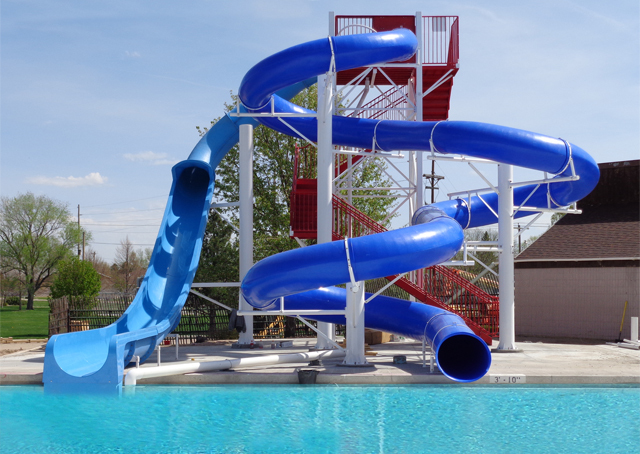 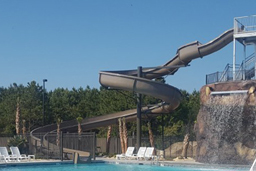 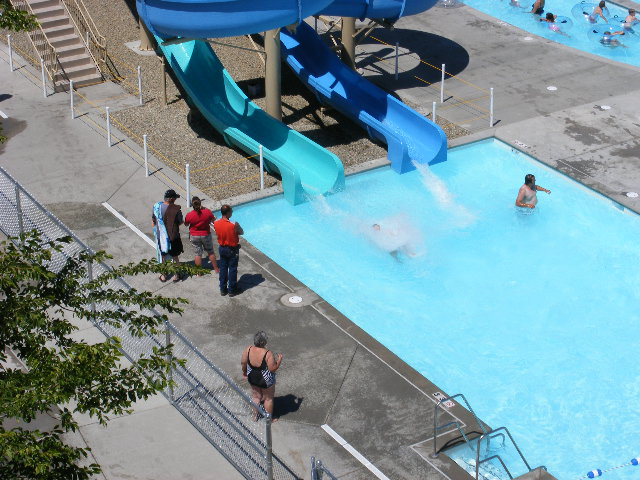 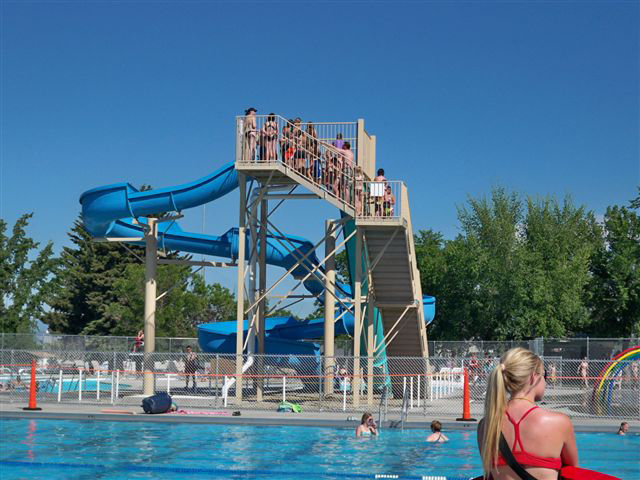 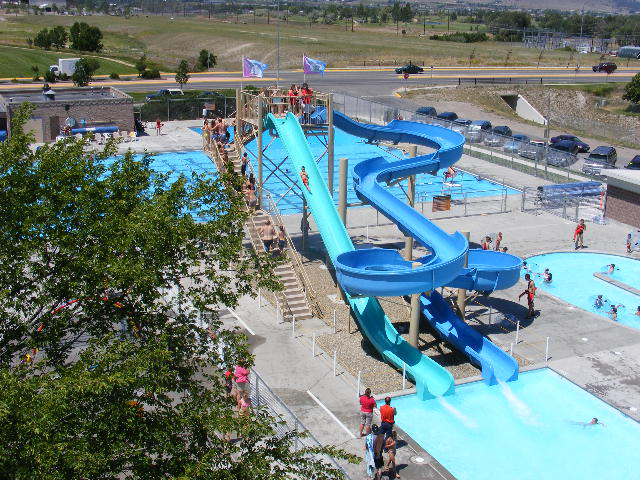 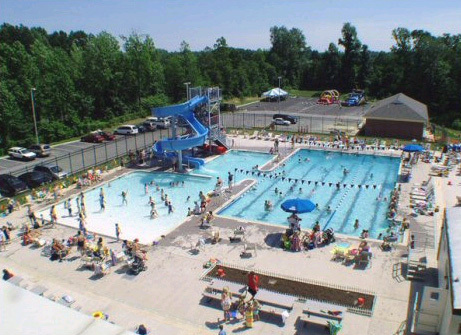 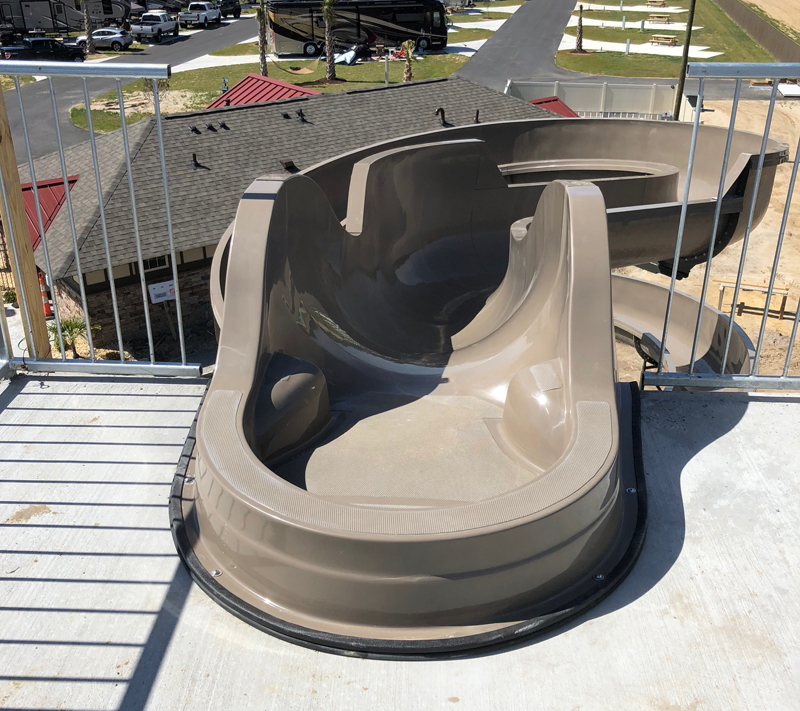 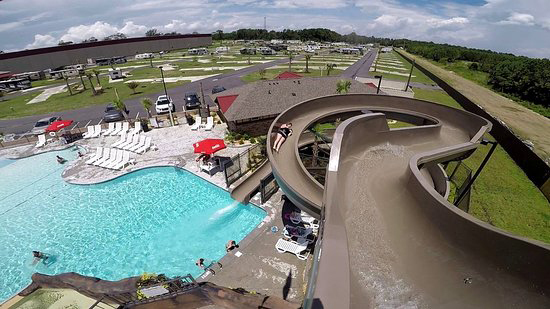 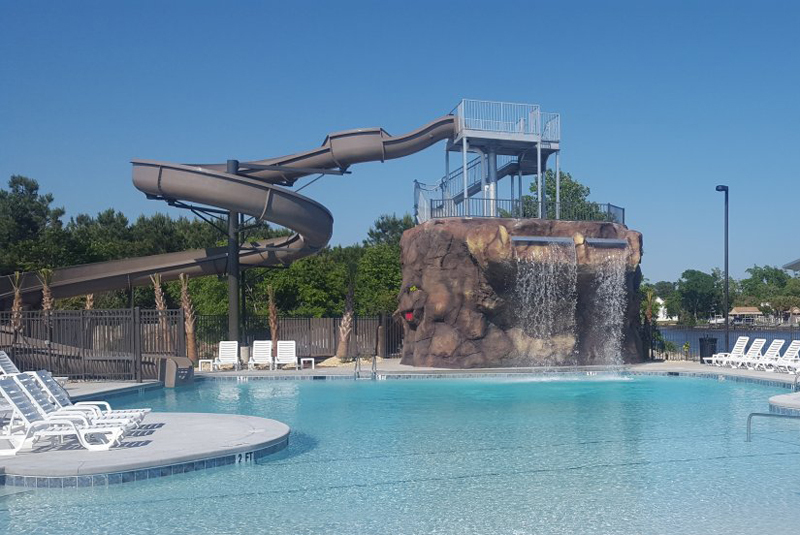 Centerline Run : 145' 0" & 130' 11"
With Exit Lanes: 43' 6" x 69' 11"
Pool Application : 42' 1" x 38' 8"
Description : Combination flume water slide featuring: (1) polyethylene flume with (3) 270° curves & (2) 32” I.D. 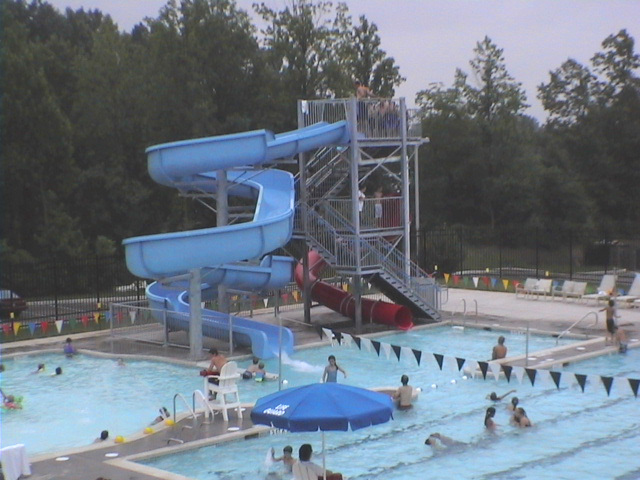 closed & 36” I.D. 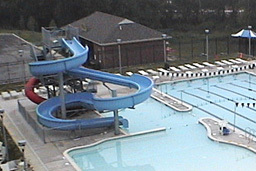 open fiberglass flume. 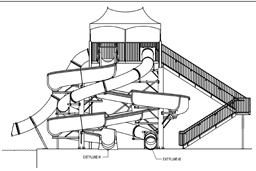 Space Requirements : 35’ 6” x 42’ 7” – Space requirements may vary with options chosen. 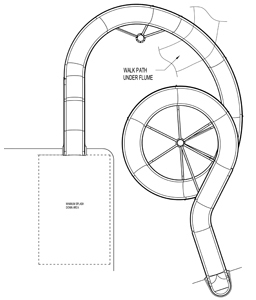 32” inside diameter closed flume fiberglass. 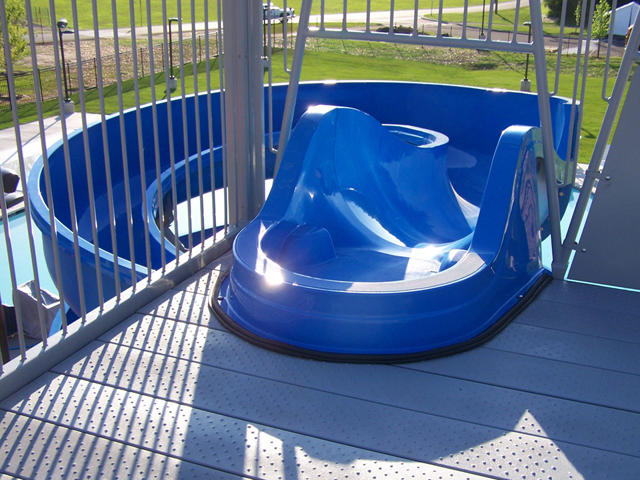 36” inside diameter fiberglass flume. 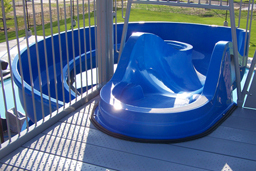 30” inside diameter polyethylene flume. 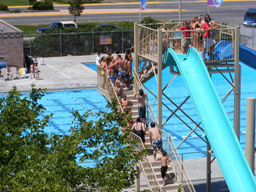 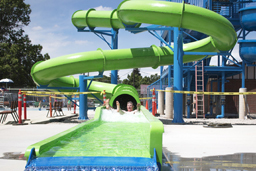 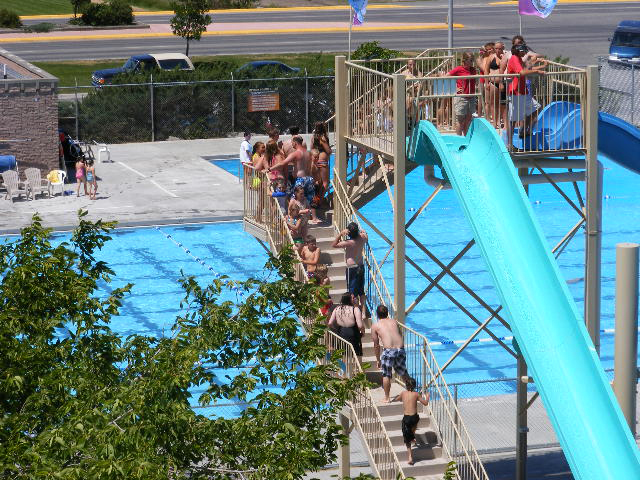 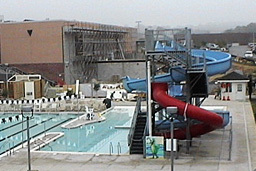 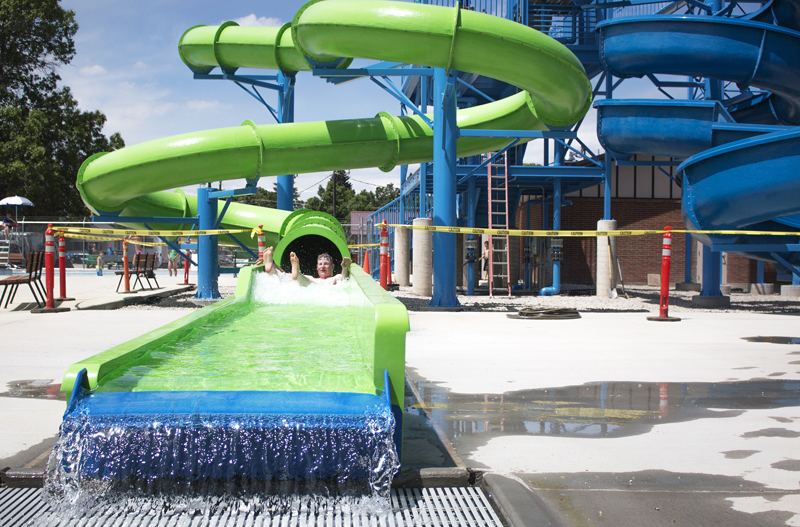 Description : Double loop fiberglass flume and polyethylene flume water slide with fiberglass exit lanes. 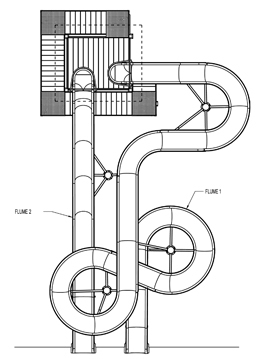 Centerline Run : Poly (closed) 133' 4"
Entry Height : 25' 0"
Space Requirements : 50' 6" x 142' 11"– Space requirements may vary with options chosen. 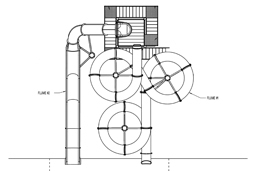 Water flow required: Open: 600-800 gpm; Closed: 50 gpm recommended; 30 to 60 gpm required. 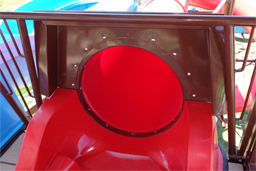 Description : Single 30" I.D. 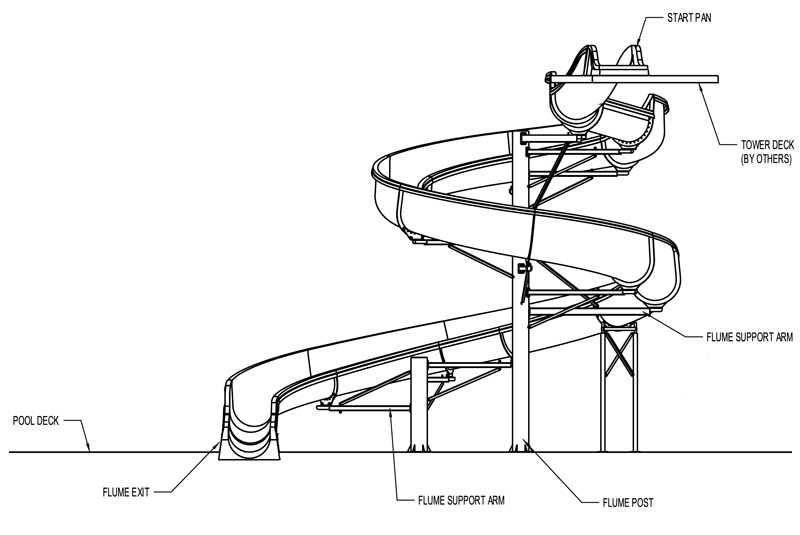 flume water slide with reverse “S" curves. 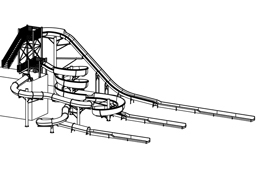 Centerline Run : 158' 0"
Entry Height : 26' 9"
Space Requirements : 43' 11" x 38' 4" – Space requirements may vary with options chosen. 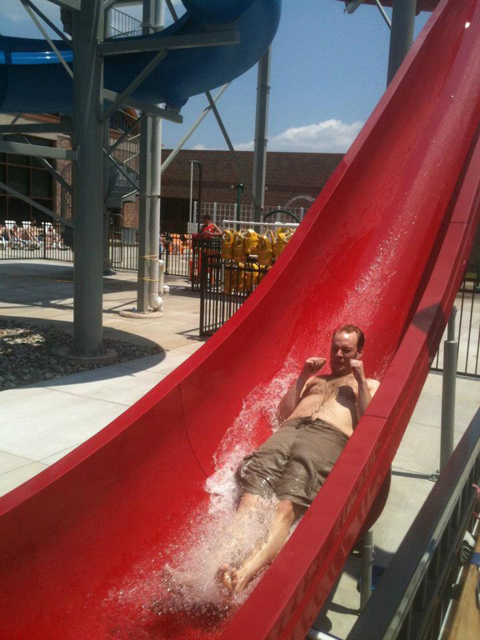 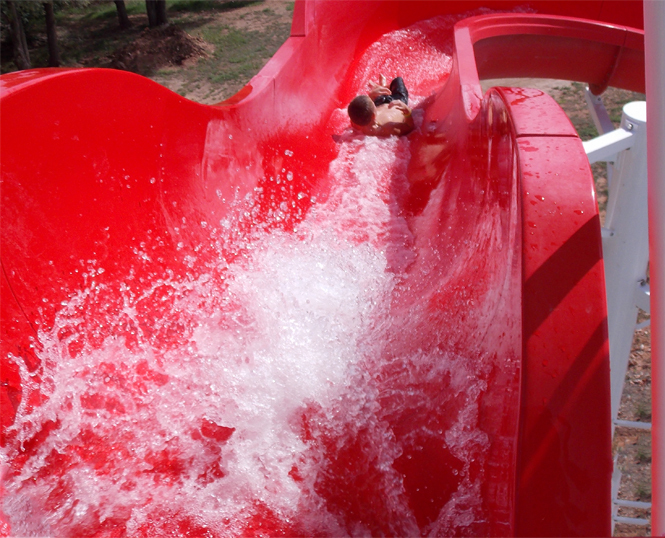 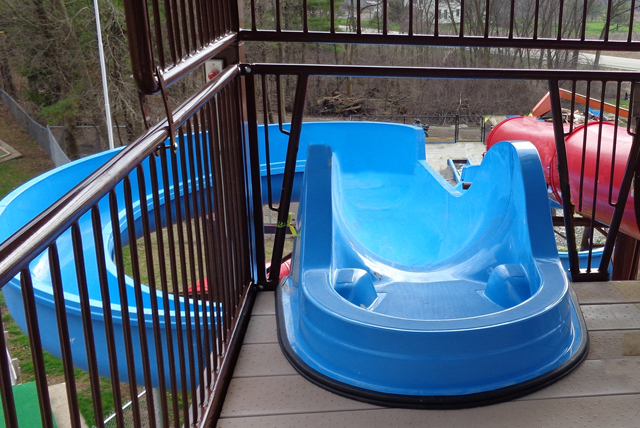 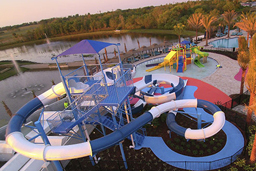 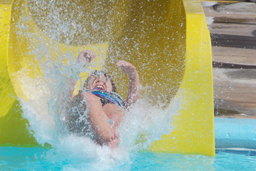 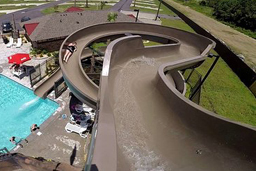 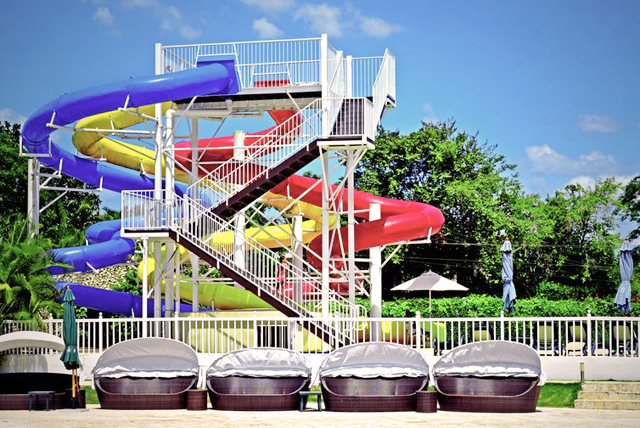 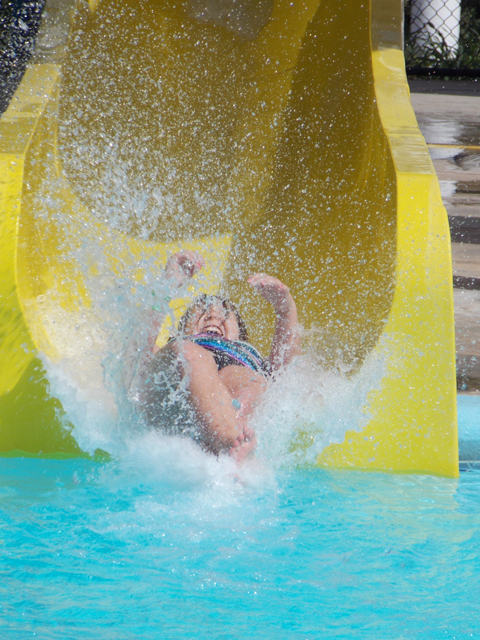 Description : Single open flume fiberglass water slide featuring 36°0 and 180° curves. 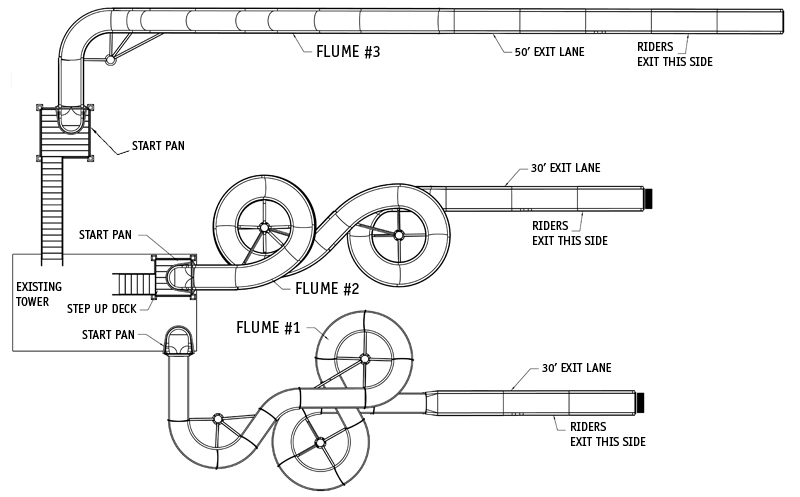 Centerline Run : 152' 9"
Entry Height : 27' 0"
Space Requirements : 33' 0" x 53' 7" – Space requirements may vary with options chosen. 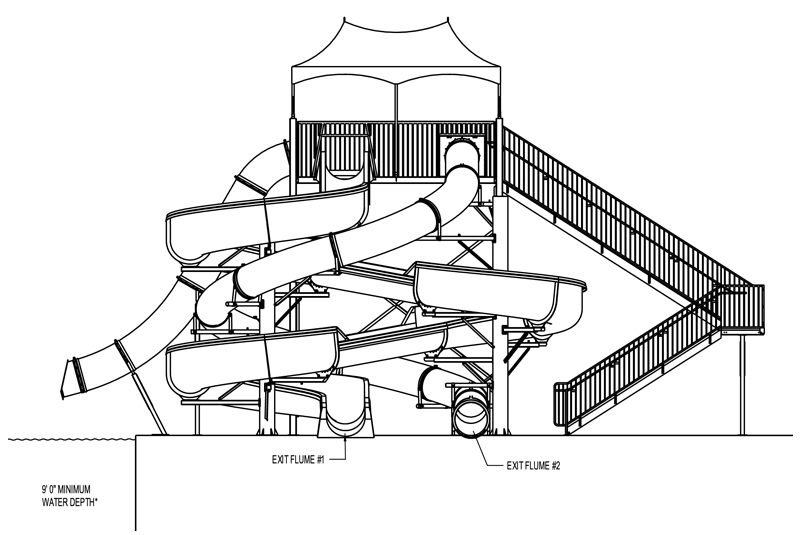 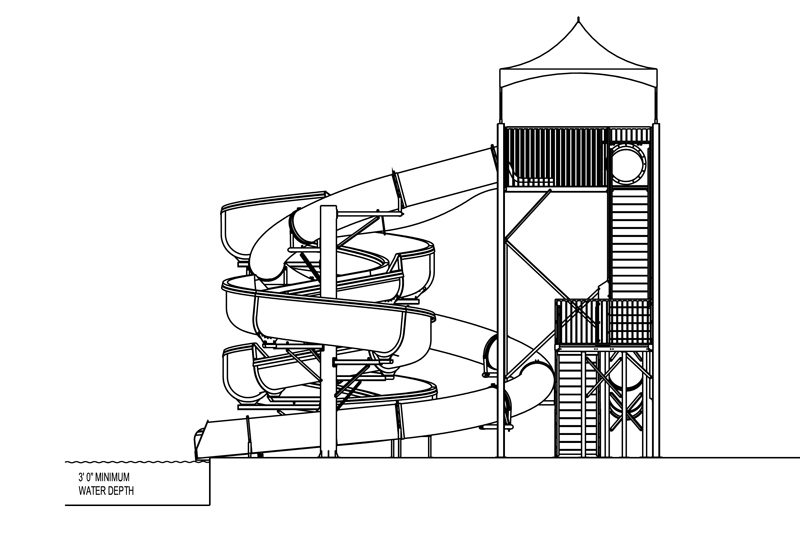 Description : Triple fiberglass flume water slide with fiberglass exit lanes . 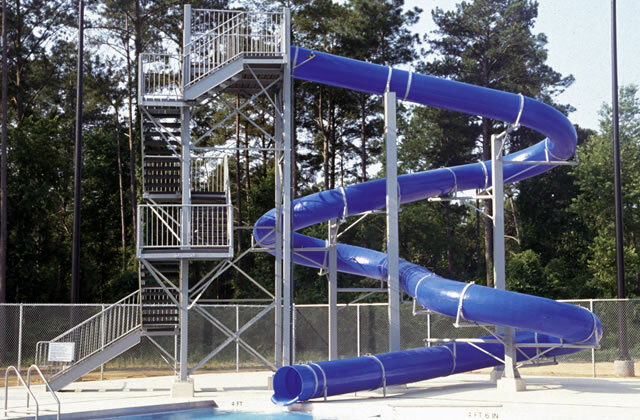 Platform Size : 7’ 9” x 7’ 9” and 6’ 0" x 6’ 0"
Space Requirements : 113’ 0” x 73’ 3”– Space requirements may vary with options chosen.